Google is a global leader in renewable energy procurement, announcing last year that it would be powered by 100 percent renewables by the end of 2017. What’s most impressive about this news? Ninety-five percent of that will come from wind. And prior to yesterday’s announcements, Google had already signed agreements to purchase a total of 1,800 MW of U.S. wind energy. And Google’s not alone. In total, corporate and other non-utility customers have signed approximately 7,000 MW of PPAs for U.S. wind power to date. Early leaders, which included Google and other high tech companies, are now being joined by a diverse range of retailers and household brands. For example, four companies, including Anheuser-Busch, Cummins, JPMorgan Chase, and Kimberly Clark, all signing PPAs for the first time last quarter. Interested in learning more about the Fortune 500 companies and other non-utility customers investing in wind? Dive into our new interactive map below. 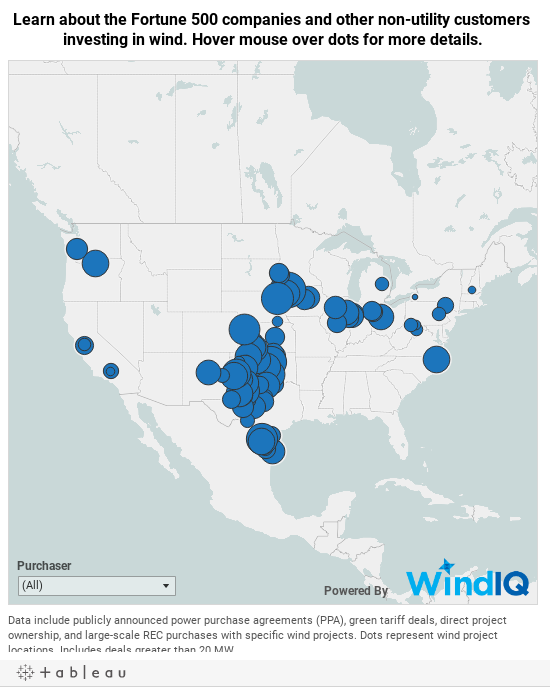 The map includes all publicly announced non-utility wind PPAs at least 20 MW in size.